With wide ranging knowledge and expertise, we offer septic tank emptying and disposal within the Dorset, Somerset, Hampshire and Wiltshire area. We empty from private properties, businesses, hotels, housing developments, caravan parks and more. 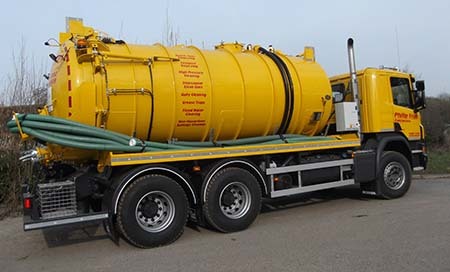 Our septic tank emptying service includes disposal of liquid and septic waste at licensed treatment works, backed up by duty of care Waste Transfer Notes and registered with the Environment Agency in compliance with current legislation. We offer an efficient and reliable service with competitive rates, and for peace of mind we can offer a reminder service when you empty is next due. Maintaining your tank regularly helps us to provide you with a more effective service. What is the difference between a septic tank and a cesspit/cesspool? A septic tank is designed to collect sewage and wastewater, to houses that are not connected to the mains sewer. Depending upon the size and usage, a septic tank will usually require emptying annually. Liquid flows into the tank and anything that floats rises to the top and forms a layer known as the scum layer. Anything heavier than water sinks to form the sludge layer. In the middle is a fairly clear water layer. With time, the solids that settle to the bottom are degraded anaerobically. However, the rate of accumulation is faster than the rate of decomposition, and the accumulated sludge must be removed at some point. Generally, Septic Tanks are emptied annually but this would depend upon usage. A cesspit or cesspool is an underground holding tank that simply collects sewage and wastewater, with no soakaway or processing, so all of the waste water is stored inside the tank and will need to be emptied more frequently. Cesspits are usually installed in environmentally sensitive areas or where space is an issue and there is not enough room to install a soakaway. How often should my tank be emptied? Do I need to be on site during your visit? Providing that our drivers and vehicles can gain access to the tank and its location, you do not necessarily need to be at home when we visit. If you need either domestic or commercial sewage treatment from a local efficient company, call Philip Trim Contractors today. All of our operatives are highly experienced, friendly and courteous. Alternatively you can call to discuss joining our planned maintenance schedule, which offers our customers a discounted rate and ensures the tank is emptied and maintained on a regular basis, helping to avoid the risks of blockages, bad odours and overflows. As a registered waste carrier, we adhere to all the necessary regulations; the waste is disposed at a licensed liquid waste disposal treatment plant, in compliance with the Environment Agency. We offer a gully emptying service, providing a quick response to all emergency enquiries. Regular gully emptying ensure gullies are clean and free of blockages. A grease trap or grease interceptor is used to capture waste produced in the kitchens of commercial properties, preventing it from collecting into the sewer system. Grease traps that are frequently emptied and cleaned will save you money in the long run by avoiding costly repairs. Our vacuum tanker team are trained and experienced in emptying grease traps.